Home General Articles Giving Tuesday: Shop Medical IDs and Make a Difference! Every year, American Medical ID supports different organizations on Giving Tuesday. We are proud and honored to partner this year with The Marfan Foundation to help support children who are living with Marfan syndrome. Giving Tuesday is a global movement created by communities in all 50 states and countries around the world. Occurring this year on November 28, #GivingTuesday is held annually on the Tuesday after Thanksgiving and the shopping events Black Friday and Cyber Monday. Giving Tuesday kicks off the holiday giving season and inspire people to collaborate in improving their local communities and to give back in impactful ways to the charities and causes they support. Anyone anywhere can get involved in #GivingTuesday. American Medical ID customers can shop for a cause and enjoy our 20% off Giving Tuesday promotion. 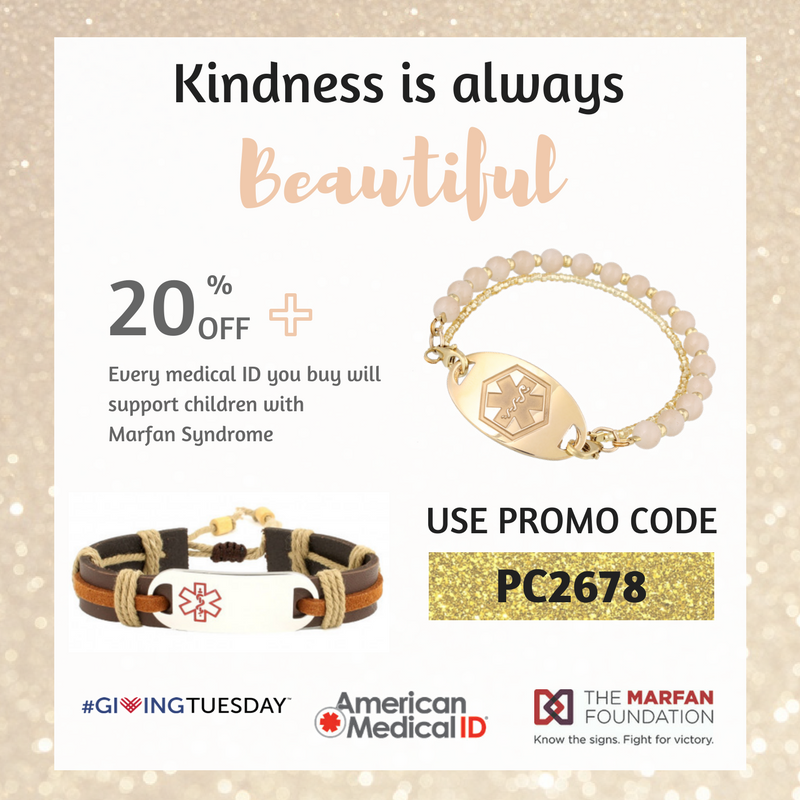 For every medical ID you will buy on Giving Tuesday, we will give a portion of the sale in your honor for the benefit of The Marfan Foundation. Whether you’re buying a medical alert jewelry for yourself or for a loved one, Giving Tuesday is the best time to purchase one of our new medical ID styles. Enjoy 20% off these beautiful medical alert bracelets and necklaces on November 28 only! Every purchase you make helps support the Marfan Foundation too. Our Giving Tuesday promotion is sitewide! Browse more medical IDs to fit your own style, comfort, and needs. Marfan syndrome is a multi-system connective tissues disorder that affects about 1 in 5,000 people. Marfan most commonly affects the heart, eyes, blood vessels, and skeletal system. Depending on the damage of Marfan syndrome, the condition can become life-threatening. American Medical ID supports the Marfan Foundation’s goal to raise $30,000 to help address critical treatment and quality of life issues so that children, teens, and adults with Marfan syndrome and related disorders can live longer and better. “It is our pleasure to be working with The Marfan Foundation and we are thankful to be given the chance to support their valuable mission. We are inspired to know more about the signs of Marfan, join hands with their community, and fight for victory,” said Rick Russell, CEO at American Medical ID. Every act of generosity counts and each means even more when we give together. Let’s show the world our common capacity to give. Join our cause by using the share buttons below and spread love and generosity this Giving Tuesday! giving tuesday, Marfan, Marfan Awareness, Marfan Syndrome, The Marfan Foundation. Bookmark.